Nephew's BBQ Sauce has separated themselves in the crowded market of BBQ sauces with creativity and quality. Nephew's makes unique (and tasty) BBQ sauces that combine sweet fruits with spicy peppers. Innovative flavors like Ghostly Pumpkin and Peachy Potle have built a strong regional fan base for the Garner, NC company. Perhaps their most highly regarded sauce is the Angry Nephew's variety. 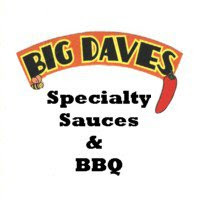 This spicy tomato / vinegar sauce was named by Country Living Magazine as one of the best sauces in America. It's also earned praise and acclaim from delish.com and several prominent BBQ bloggers. Angry Nephew's BBQ Sauce is packaged in 16 oz. mason jars. Despite its ketchup base, the sauce is relatively thin. It pours quickly, like paint, from the wide mouthed jar. Angry Nephew's is a deep, rich red and looks great in the jar. As I mentioned, all Nephew's BBQ Sauces use select combinations of fruit and chili peppers. Angry Nephews is a bit more conventional in that the "fruit" featured is tomato. In this case, the chili pepper is the infamous jolokia chili. Affectionately known as the "ghost pepper," jolokias are recognized as one of (or arguably the) hottest chilis on earth. Despite the presence of the raging hot ghost chili, Angry Nephew's BBQ sauce isn't quite as scary as the label would indicate. In fact, the initial taste didn't reveal any heat at all. The heat in Angry Nephews is sneaky. It builds slowly in the back of your throat with each bite. Half way through my first test of Angry Nephew's, I found my forehead sweating and my lips tingling. It was enough to make me reach for a glass of milk, but not so overwhelming that I felt the need to stop eating. One unique aspect of Angry Nephew's BBQ sauce is that it features cola as a primary ingredient. I frequently use cola in BBQ sauces and marinades when cooking at home, but I rarely see it used in commercially produced sauce. I like the bite as well as added sweetness that cola provide. It actually works well for balancing vinegar in sauces. Speaking of vinegar, Angry Nephew's features apple cider vinegar that produces a detectable tang. Given that Nephew's BBQ Sauces are produced in Central North Carolina, it's only fitting that vinegar plays a role in the flavor. It's practically state law. For my first test of Angry Nephew's, I used it as a wing sauce. The consistancy was perfect for evenly coating the wing. I also used the sauce on a slow smoked brisket. I warmed the thin sauce and poured it over the smokey sliced beef. The pairing was BBQ perfection. Every once in a while you stumble across flavor combinations that are a home run. Angry Nephew's BBQ sauce turned out to be the perfect accent to brisket. The spice and tang were just what the bold flavored beef needed. It's now my #1 recommendation for a brisket sauce. 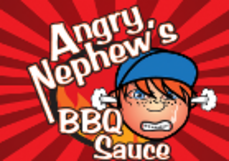 I've really enjoyed all the flavors of Nephew's BBQ Sauce that I've tried, but Angry Nephew's is my clear favorite. It's great on chicken, but really excels when paired with beef. I'll become a staple in my household whenever brisket is on the menu. Check out all of Nephew's BBQ products on their website. Don't forget to see Angry Nephew's star rating on our "Product Reviews" page. 1 Response to "Angry Nephews BBQ Sauce"